So after much (much, much) discussion we finally invested in a Thermomix! And I do say invested because they cost A LOT. We've only had it for a couple of weeks and I am seriously wishing I had bought one years ago. I already make most of what we eat from scratch but even with all the kitchen appliances I have I still couldn't make a decent risotto, non-dairy milk, nut butter, ground almonds or rice flour. The plan with the Thermomix is to make virtually everything from scratch, meaning we not only save on our grocery bill but we eat even more healthily than we do now. In these few short weeks I have made vegetable stock, oat milk, rice/almond milk, pasta sauce, multiple batches of baby food, soups, custard, sorbet, risottos, nut butter, rice pudding, porridge and much more. On an average day I would use it at least 4 times and at the end of the day the kitchen is clean, no more pots and pans piled up on the bench because they don't fit in the dishwasher. I will be posting lots of thermomix recipes as time goes on but I will always post non-thermomix instructions as well. I know these machines aren't for everyone. And one thing I have made clear is that I will still be teaching my boys to cook the old-fashioned way as much as possible! 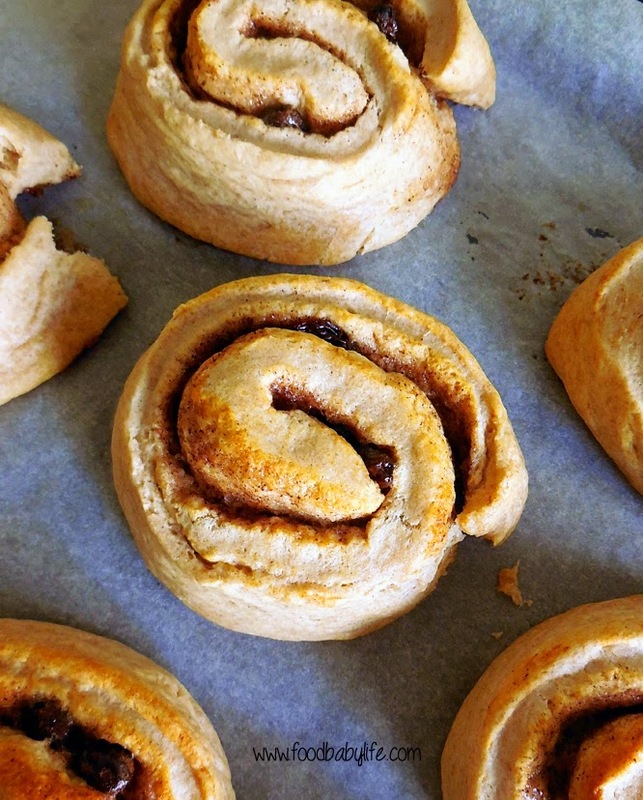 So for the very first thermie recipe for the blog I have chosen these delicious Spelt Cinnamon Scrolls. They were SO quick to whip up that I was able to make them on a study day (when I normally don't cook at all during the day) so they were ready for the big boys straight after school and kindy. They were a big hit with my kids. And looking at the picture above I've just realised someone's sneaky little fingers had gone and pinched the edge of one of them while I wasn't looking! Can you spot it? Pre-heat the oven to 200°C and line a baking tray with baking paper. Set the scale to 0 then add the baking powder and enough flour to make up 300g, then the butter and coconut oil and mix for 5 sec on speed 5 until it resembles fine breadcrumbs. Place a small jug or bowl on the top of the Thermomix. Set the scale to 0 and then pour in 150 grams of milk. Remove the jug. Set Thermomix to locked position and knead for 1.5 minutes on interval setting. While it is kneading, gradually pour milk through the MC hole until a dough is formed. (mine took an extra 30 seconds or so to come together. Tip the dough onto to a lightly floured bench, ThermoMat or baking paper. Roll out the dough into a rectangle approximately 25 x 40cm and ½ cm thick or about as big as your tray. Place butter, coconut oil, dextrose and cinnamon into the mixing bowl and mix for 10 seconds on speed 4. Spread the mixture evenly over the dough rectangle and sprinkle over the sultanas if you’re using them. Roll up the dough from either the long side or the short side of the rectangle (short side makes fewer but more scrolly scrolls and long side makes lots of smaller scrolls). Using a sharp knife, cut rolled dough into pieces approximately 3cm wide. Place the dough pieces on your prepared tray. Bake for around 12-15 minutes or until golden brown. Remove from the oven and allow to cool slightly before eating. If you don’t have a Thermomix, make the dough in a large bowl. Rub the butter into the flour and baking powder until it forms breadcrumbs. Pour in the milk and use a butter knife to gradually bring the ingredients together and form a dough. Follow above instructions to roll out the dough. Beat together the filling ingredients in small bowl and again, follow the instructions above for rolling, slicing and baking.